The following figure shows the high-level steps involved in developing a simple inbound business-to-business (B2B) flow from an application to trading partners using Oracle Application Integration Architecture (AIA). The source and targets in the mapping are reversed. The B2B document received from trading partners is the source of the mapping. The AIA Enterprise Business Message (EBM) is the target of the mapping. The B2B document is defined in Oracle B2B. The XML schema of the B2B document is uploaded in the AIA Metadata Repository. The Enterprise Business Object (EBO) and the EBM to be used in the integration are identified. Functional mapping between the B2B document and the AIA EBM is complete. In inbound B2B document flows, the AIAB2BInterface service listens for new B2B documents received by Oracle B2B and routes them to the requester B2B services. ■ Receive B2B documents sent by trading partners from Oracle B2B. ■ Transform B2B documents into AIA EBMs. ■ Use EBMs as request payloads to invoke AIA Enterprise Business Services (EBSs). The next step, is to develop a new EBS or use an existing EBS that is invoked by the requester B2BCS. The next step, is to develop a new or extend an existing provider ABCS. The provider ABCS processes the AIA EBM by invoking application APIs or web-services. 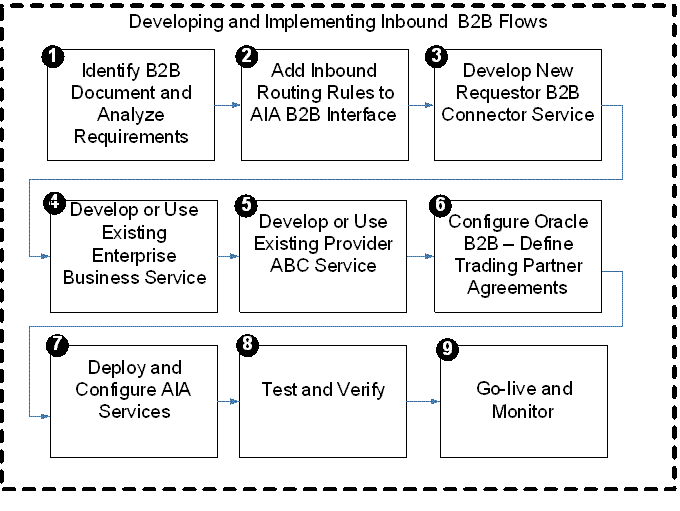 The next step, as shown in Figure 18–21, is to create trading partner agreements in Oracle B2B. The next step, is to deploy the AIA services. You can deploy the services to a target Oracle SOA server using Oracle JDeveloper. The next step, is to test and verify. Before you go live with your B2B integration flows with your trading partners, we recommend that you complete a sequence of tests for your newly developed or deployed AIA services, which make up the B2B integration flow.